Alyssa Goins serves LifeWay Kids as the Senior Project Leader for all things MUSIC. She’s a great friend and a awesome musician. She’s been pondering a few questions that I wanted to pass along to you. Does your church have a children’s choir? If so, when does it meet? What resources do you use? If not, did you in the past, and why not now? What current pressures weigh against a child’s involvement in church activities? My role as Senior Project Leader means I produce products that are used in churches. My desire is to use the opportunity I have, with the resources available to me, to give Kids Ministry leaders something they can use to further God’s Kingdom. 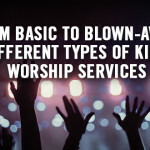 I have a heart for helping children’s leaders lead kids to love Jesus and to become worshipers of the one true God. I have a 2nd and 3rd grade choir at my church. I direct them with much help from 4 volunteer leaders. Sometimes we have as many as 27 and as few as 10 kids. Our church is a downtown church so our situation naturally presents transportation issues. We are also a traditional church so some of our challenges are not the same as other churches. I’d love to hear from you about your current situation. Can you respond to this blog or to me directly at alyssa.goins@lifeway.com to let me know about your willingness to answer a few (4 or 5) questions? I’m thankful for Alyssa’s ministry here at LifeWay and at her church. I’m thankful for her desire to extend that ministry to you. So, if you have a few minutes… take the time to answer the four questions by replying to this blog or emailing her directly. I know she’ll use the information to mold her work and resources for growing God’s Kingdom though Kids Ministry!